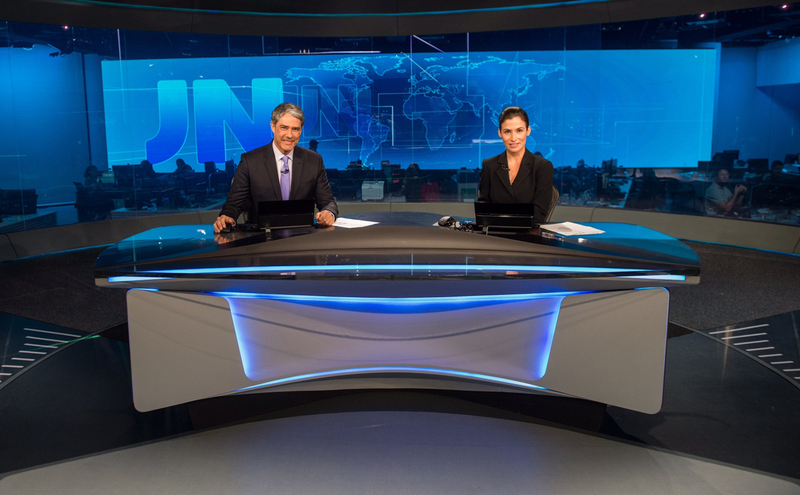 The sprawling studio for Brazilian broadcaster Globo’s signature evening news program, “Jornal Nacional,” blurs the lines between real and virtual by expertly combining hard scenic elements with laser projection, high tech glass and augmented reality. The entire look was created in house by Globo’s creative team, led by Alexandre Arrabal. From early on in the project, the team opted to place the anchor desk in the center of the newsroom, a location that served as a “hub” for much of the other design decisions. The team envisioned the anchor area as “a glass cylinder, that could be transparent or opaque and would receive projections,” explained Arrabal. Previously, the main studio was perched above the newsroom, providing a balcony view of the work below. Behind the anchor desk itself is a nearly 50-foot span of curved glass outfitted with a special film that gives the production team the ability to darken it and bounce laser projection off it. Early sketch of the design concept. The space is also equipped with a massive LED wall that’s over 50 feet wide and nearly 10 feet high, which is used to display topical and branded graphics, behind the main anchor area. 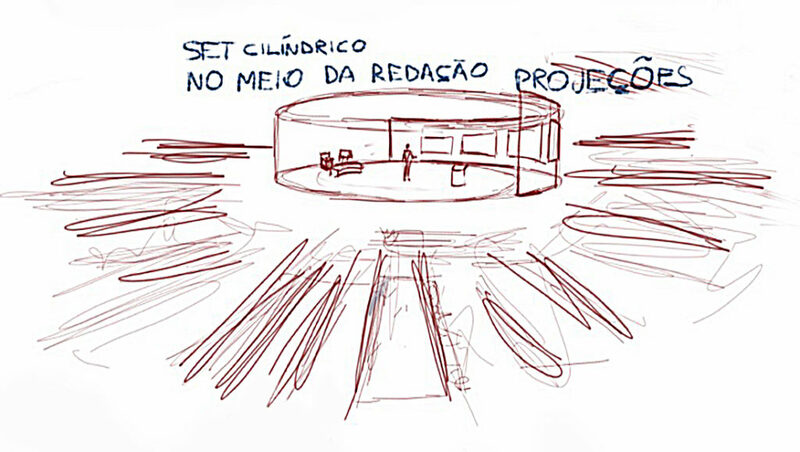 The entire screen can be raised, allowing the windows of Globo’s new facility to flood the workspace with natural light at times when the broadcast isn’t on the air. The entire screen can be raised, allowing the windows of Globo’s new facility to flood the workspace with natural light at times when the broadcast isn’t on the air.